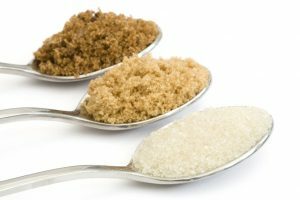 I have written several blogs in the past about the connections to and recommendations for sugar and cancer. If you didn’t have a chance to read them, this is a link to my 4-part series. Does Sugar Feed Cancer? To continue on this theme, I want to explore a follow-up question, which is: Is there one sugar that is better (less bad) than others? Let’s explore this question today. In order to answer this, I would like to suggest that there are two considerations. The first of these is the glycemic index. The glycemic index (GI) is a measure of the effect of a food on the blood sugar level. The GI is given as a numeric measure. For example, pure glucose has a glycemic index of 100. This is considered high. To give you a picture of what this means, after eating a high GI food, there would be a rapid rise in blood sugar, a high peak blood sugar and a rapid decline. In contrast a low GI food like chick peas (garbanzo beans) would have a glycemic index of 42. This would result in a slow rise in blood sugar, a lower peak and a slow decline. This translates to a lower amount of insulin. Make sure you read my 4-part series on Does Sugar Feed Cancer? to understand the perils of high insulin levels. Source: www.glycemicindex.com Some sugars have several GI’s depending on the brand. The numbers above represent the average of the values found on the www.glycemicindex.com database. High glycemic index diets have been shown to be linked to cancer. The strength of this relationship depends on the type of cancer. For more information on this, see the links to studies below. If higher glycemic index diets are linked to cancer, would choosing a low glycemic diet be protective and more precisely, would a lower GI sugar be protective? If it were, by looking at the above list, stevia, xylitol and agave would be the best (least bad) sweeteners. But before you throw out your sugar, honey and maple syrup, let’s look at the second consideration for sugar and cancer. The second consideration is the fructose content. The reason why is that fructose has been considered responsible for deep belly fat, known as visceral fat. This type of fat has been labelled as a cancer promoter for its ability to produce inflammatory cytokines and estrogen. So, let’s look at the fructose content of various sugars. I will add a column to the previous chart. Now with this added element, agave isn’t looking like a good choice anymore.The sugars that are both low GI and low fructose are stevia, xylitol, coconut palm sugar and maple syrup. Would using one of these sugars instead of honey, table sugar, or agave make a difference for cancer risk? Unfortunately, I don’t have a clear evidence-informed answer on this, but what I can offer is my opinion. I think the type of sugar you choose has the potential to make a difference in the amount of insulin circulating in the blood as well as the amount of visceral fat. The impact of this difference will depend on: the amount and frequency of sugar consumed, the composition of the rest of the diet, other health habits and any predispositions to cancer. Over my many years of working with cancer patients, I find a common theme is that they want to do everything they can do reduce cancer risk. I suspect this would be no different. So, if there is some hint that using coconut palm sugar in their muffin recipe might be better than table sugar, then I think many would make this choice. So, I believe that is the answer for now. In the meantime, I will continue to examine the research and let you know if a lower GI, low fructose sugar shows an advantage over high GI, high fructose ones. In the meantime, let me say a few words about these sugars. Don’t stop reading yet, as one of these has safety concerns linked to cancer. Maple Syrup – made from boiling the sap of sugar maple trees. Sap made from early spring tapings is lighter in both flavour and colour while the late season harvest delivers darker colour and stronger flavour. I could not find any difference in the glycemic index or fructose content based on these qualities. Coconut palm sugar – is made from the sap of flower buds of the coconut palm. It looks like brown sugar but with a dryer texture. It substitutes one to one for brown sugar in recipes. Xylitol – discovered by the Finish people during sugar rationing of war time. It can be made from birch bark. Chemically it is a sugar alcohol and can cause diarrhea with large intakes, so it should be used in small quantities. It is often used in chewing gum and has been shown to reduce dental caries. Stevia – this sugar is made from a South American plant. This sugar is still being evaluated and currently is being studied for safety and would likely not be the best choice for someone looking to reduce cancer risk as the Memorial Sloan Kettering Cancer Center reports that stevia at high dosages may have weak mutagenic activity (causes changes to the DNA). This is likely not the best choice for peace of mind, even though the concern is only for high doses. Limiting added sugars is recommended for overall health as well as reduced cancer risk. The two main concerns with sugar and its link to cancer are: it’s effect on blood sugar and insulin levels and its ability to be stored as visceral fat. Further protection may be gained by choosing sugars that are both low glycemic and low fructose and otherwise safe, but the benefit, if there is one, is likely very small. This leaves three choices: maple syrup, coconut palm sugar and xylitol. Choosing a plant-based diet with focus on vegetables, fruits, whole grains and plant proteins is a good way to reduce cancer risk, as is regular activity and getting and staying lean. Glycemic Index, Glycemic Load, and Lung Cancer Risk in Non-Hispanic Whites.Cancer Epidemiol Biomarkers Prev. 2016 Mar;25(3):532-9. Melkonian SC, Daniel CR, Ye Y, Pierznski JA, Roth JA, Wu X.
Dietary glycemic index and glycemic load and risk of colorectal cancer: results from the EPIC-Italy study. Int J Cancer. 2015 Jun 15;136(12):2923-31. Sieri S, Krogh V, Agnoli C, Ricceri F et al. Glycemic index, glycemic load and cancer risk. Ann Oncol. 2013 Jan;24(1):245-51. Hu J, La Vecchia C, Augustin LS, Negri E, et al.